We have shared quite a few posts relating to vision and visual perception! is made up of many areas related to vision and the ability to perceive sight with relation to movement of the hands and body in functional tasks. 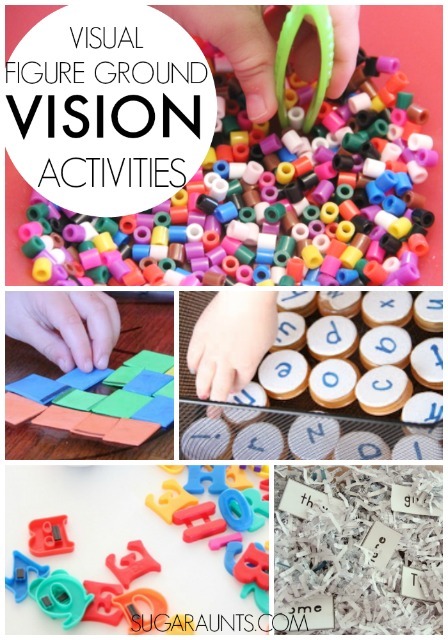 Visual perceptual skills in kids are necessary for so many things...from self-care to fine motor skills, to gross motor skills...all parts of a child's development require visual perception. There are many pieces to the giant term of "visual perception". When it comes to vision, there is so much to learn! 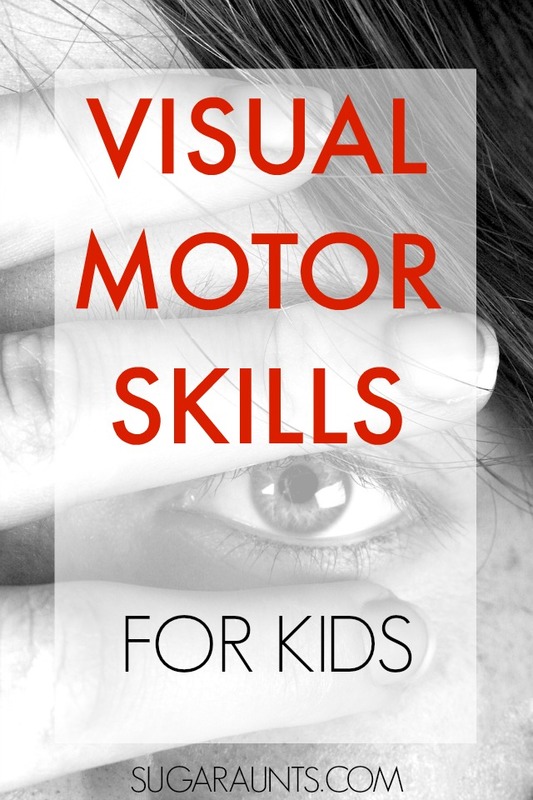 Start by checking out Visual Motor Integration developmental milestones for age-appropriate skills that children typically master from age 0-5. 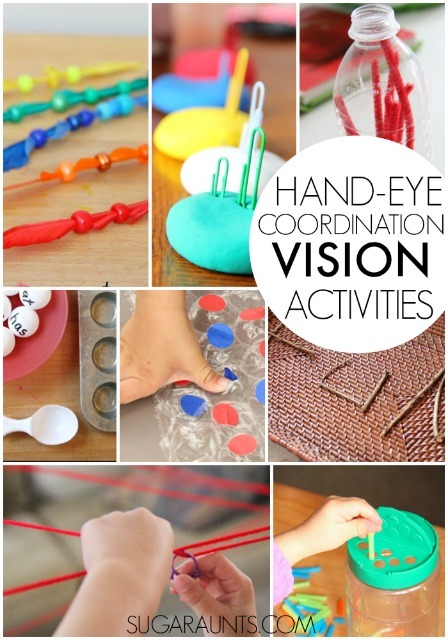 Hand-eye coordination is using the information received through the vision system to coordinate the hands with control, in order to complete a task, such as handwriting or catching a ball. Visual scanning is essential for handwriting skills, puzzles, word searches, mazes, and many many functional tasks. Scanning a room for a missing sock may be difficult if a child demonstrates difficulty with visual scanning. 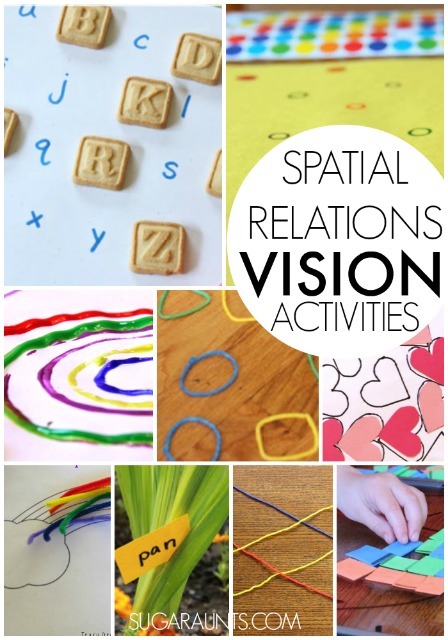 Visual Spatial Relations is organizing the body in relation to objects or spatial awareness. This is an important part of handwriting. Spacing pieces of a puzzle amongst the others and writing in relation to the lines is one way to work on this skill. 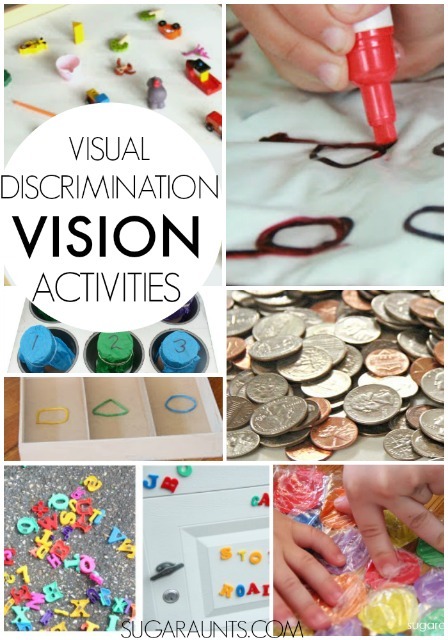 Visual Discrimination is determining differences in color, form, size, shape. Visual Closure is the ability to fill in parts of a form in the mind's eye to determine shape or a whole object. Visual Figure Ground is the ability to locate objects within a cluttered area (think "I Spy"). Finding a red square among the pile of foam pieces is one fun way to work on this area of visual perception.